While processing power and camera quality have been improving at a fast pace in recent years, battery life and charging times have only made comparatively small steps forward and remain a major bottleneck in smartphone performance. We've seen several concepts and technologies, for example Storedot and its fast charging technology, addressing the issue being presented but thus far none of them has made it into mass production. Now, Chinese manufacturer Huawei has presented some potential battery tech advancements: two prototype removable lithium-ion batteries that, with a custom charger, can be fully recharged in only a few minutes. In a demonstration video the smaller of the two batteries goes from zero to 68% charge in only two minutes, but unfortunately its capacity is not enough to power a mobile device for long. The second prototype, which according to Huawei provides approximately 10 hours of talk time on a smartphone, gained a 48% charge in five minutes. Huawei does not provide a lot of detail about how the batteries work but says it is using heteroatoms - atoms that aren't carbon or hydrogen. According to the manufacturer, heteroatoms can accelerate charging speeds without having a negative impact on the battery's overall lifespan. You can watch the charging demonstration in two videos for the two-minute and five-minute experiment. Qualcomm QC 2.0 fast charging is already in many new phones and many brands of fast chargers. It is about this good and does not require taking the battery out of the phone. QC is only a spec. It doesn't mean the batteries can handle it. My Galaxy Note4 supports it, but after careful measurements, it turns out it is only 30% faster than a normal charger. The main limiting factor is the battery. When charged too fast, it builds up too much heat and it degrades faster. "Huawei can quick-charge your phone without hurting its battery"
I just bought an oppo with vooc fast charge - its awesome. Oppo is a 10 years old Chinese company, vooc fast charger is its charger. Oppo made its name for making electronics such as its DVD players are well known for audiophile b/c its only selling for $1300 USD. It just likes Emotiva, another Chinese company, its $500 USD CD Player as seen by audiophile world that $500 USD is a basement price . Mike summed it up pretty well. 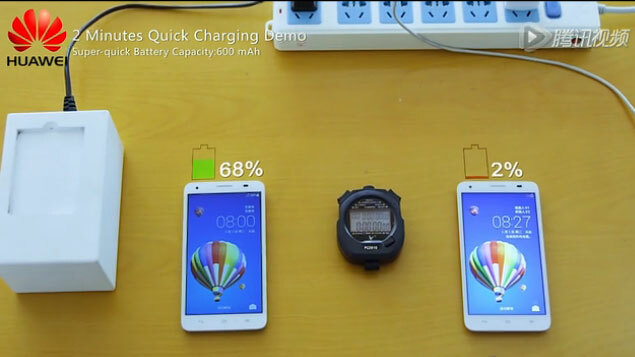 You can read about Qualcomms quick charge and Oppos VOOC over at the link below. Currently I think VOOC is the quickest you can get. I don't believe any of this. AFAIAC, if I can't buy it and test it myself, they are just illusion, like those performed by magicians on stage. I have heard too many claims and none of them appears on the market that really can be charged in a few minutes, either because of cost of manufacture or other safety issues. Even if one does actual appear, I would seriously doubt its safety and longevity . Besides, China is full of fakes and scam, I better believe the moon is made of cheese. It was 10 years ago's China. NOT now especially Huawei's phone you much try by yourself, then you know what we talk about it. Google Nexus 6P is made by Huawei as it is very much designed by Huawei too. Battery swapping > Quick Charge. It takes 30 seconds to swap a battery. And the fastest I can drain a device is like 3 hours. As long as a spare battery charges in 3 hours, I think I'm good. Also, quick charging is known to shorten the battery life. We're already 99.99 to a perfect and safe solution. Now...getting Apple to let us swap batteries....we might as well be talking about hoverboards. Totally agree. I had a windows PDA/phone that came with two batteries once, never ran out on both in a day and the dock had a space for both so every day they were both ready to go. That plus a modern smart phone would be great. I'd be curious of the charge time to 100%. I know that on my S5, it charges very quickly to 80% or so. The last 5% seems to take longer than the first 50%, although I've never timed it. As far as electric cars, why not keep charged swappable batteries at all the gas stations? Swapping out for a fully-charged battery wouldn't take any longer than filling up a tank with fuel. However, I'm sure the oil companies would never allow it, or would sabotage it if forced to allow it. Yes, "last 5% seems to take longer than the first 50%" if you can really charge to 100%. Tesla has already designed for battery swapping. The infrastructure requirements are rather onerous, and would require all manufacturers to built to a common standard. I suspect that our Samsung quick chargers taper off as the battery reaches max capacity. "would require all manufacturers to built to a common standard. " Eric, that's not so. Other than the voltage, there are dozens of different sizes for auto batteries, as there are for cell phones. There are different terminals as well. You're referring to legacy batteries, for legacy cars. There are no longer dozens made for a car built in the last few years, and they could easily reduce this to a single design (probably modular), if the need were there. Electric cars are a new phenomena, and it would not be difficult to standardize on a shape, and connection method that would make this possible. The point is: I believe it's doable. I would like to see this in an actual phone and not in an external charger. I do not think current Phone's micro USB can handle such high charge current/AMPs. Brought to you by wah way - the company that said, "patent? what patent?" Does it discharge as quickly as it recharge? I do not think so, but high current fast change may reduce battery life. But, "Huawei can quick-charge your phone without hurting its battery"
I like to see some MFC can make this kind of charger for my cameras' battery. The company that copied every single thing used in its product is demonstrating new techs. I don't recall China have a April Fool's day. I bet most people do not even know why Huawei is lambasted as "copycat" to begin with. you are mistaking with Xiaomi obviously. And FYI, your carrier is probably using Huawei equipments for years. > I don't. Is it? Yes, it is. Huawei was founded by Chinese gov't in 80s to "copy" the landline switches from the Siemens. (How many here even know what a landline switch is?) But already by 90s they were producing switches which were actually better than the original. Since then, they have diversified into various communication and telecom manufacturing, and now are THE leading manufacturers of the communication equipment in the world. Only recently they have started producing consumer products under their own brand, mostly to popularize the name. But even before that, they were already an OEM manufacturer for many better known brands of the mobile phones. IOW they have designed and manufactured phones longer than they have sold them under their own name. The world is in great progress, especially China. Please do not use old viewpoint to see new China today. Its remind me 100 years ago's China. That time the people was like what you are to view world as to view today's in China. If true, MUCH more useful for electric vehicles! Do we have to choose ? 2-3 minutes to 80%/more would be a great achievement. Even if the tech would degrade batteries faster (only 100 charge cycles), the number of applications is large, esp. in the professional areas. The videography comes to mind first: recharge the batteries faster than the camera drains them. This could be a scam. Let's say when the battery is charged, it gives 5-10 minutes of total use. So charging the battery from 2% to 68% gives the user 6 minutes of use. I want someone independent to test it. I am very skeptical. If this really works it would be a useful advance. Right now, every time you read about a "fast charging battery" what it really means is they fast-charge to around 75% and trickle the rest, hoping that is enough for you to think it's useful. Fast-charging all the way to 100% would shorten the lives of current lithium-ion batteries. But of course, we will have to wait and see if this is a real technology or just PR. Let's sue them for discrimination. He? Cameras uses the same battery technology. Yeah, but most cameras today still have removable batteries. It's always faster to swap in a spare battery than charge an internal one. It matters mostly to tablet and phone users because most of them don't have swappable batteries. > It's always faster to swap in a spare battery than charge an internal one. If charging to 80%/more would take only 2-3 minutes, in many cases, it would be faster than swapping the battery. You must be the slowest battery switcher in the world. I can swap into 100% on my camera in under 15 seconds, and in about 40 seconds on my phone, if you include shut down and boot time. No. I'm just experienced, and not a shallow show off like you. Because I also count the time and overhead of: buying the extras, keeping the extras charged, getting the extras out of the bag, cursing if forgot them at home, finding a clean place to sit down and actually do the damn switch. Lots of things are smooth and easy - if only one conveniently "forgets" about the logistics. Heteroatoms as opposed to homoatoms? So lets say a battery, phone or otherwise, has a capacity of 2000mAH. And by some impossible process you have 100% efficiency and you can charge it up from empty in 2minutes.